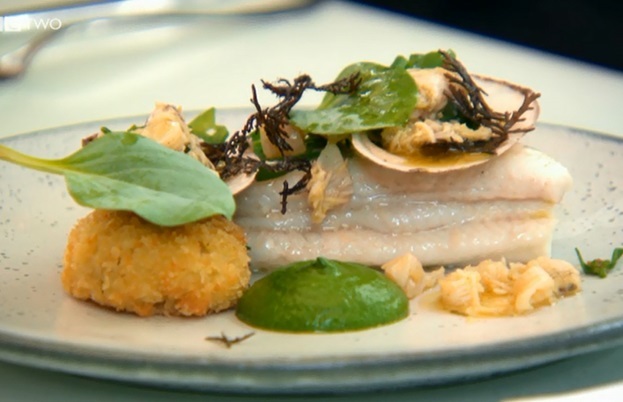 The first week of Great British Menu 2014 culminated with the Northern Ireland finals. The scene was set for what judges Prue Leith, Matthew Fort and Oliver Peyton are looking for this year: dishes worthy of war heroes to mark the 70th anniversary of D-Day. The meal kicked off with Raymond’s “Pigeon Post”, a Normandy-inspired dish of pigeon with blackberry sauce and a confit pigeon leg with a message carried in its claw. The dish scored an eight during the week and judges seemed in agreement that the pigeon was stellar. “Every ingredient bursts in your mouth,” said Prue. “Every item has been thought out,” agreed Celia. And Oliver declared the fig flapjack “a lovely little surprise”. There was some question over whether Winston Churchill - a great animal lover - would have approved of the confit leg bit, but all the same, the judges cleaned their plates which seemed a good sign. Up next was Chris’s “Fly for Victory”, which scored a measly five during the week but which he attempted to step up by replacing mackerel with duck. It didn’t seem to help. The judges liked the beetroot, but that was all that came through. “I don’t like the balance of flavours… it seems cobbled together,” said Oliver. “He hasn’t thought about the brief at all,” said Prue. 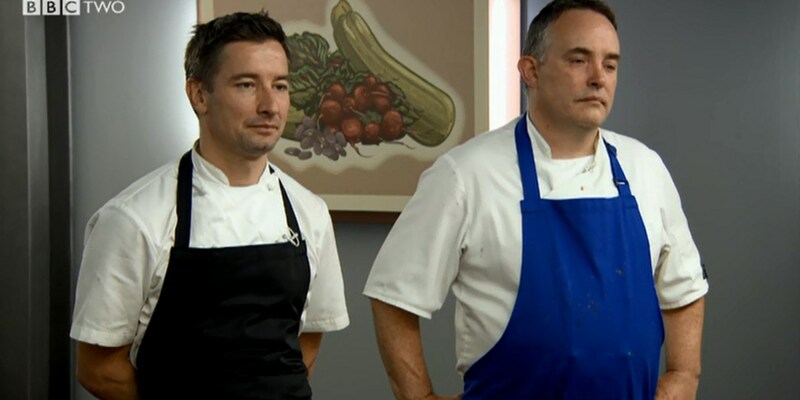 So a rough start for Chris but would Raymond continue cranking out the hits with his fish course? Alas, no. Again, inspired by his trip to Normandy, Raymond served John Dory with ham braised in Normandy cider, topped with tapioca dressing and caviar, then finished with a camembert sauce. Alas, the cheesy finish may have been a bit too far (“this was absolutely delicious until I tasted the camembert,” said Oliver). Indeed, all of the judges seemed to think a basic tartare would have been preferable. This gave Chris a chance to step up, and so he did with his “We Are Captains of Our Soles”: spinach and sea vegetable puree with butter-poached dover sole and croquets of clam and béchamel. “Beautiful, so fresh, so clean… just the food I like to have…and a sense of history which is very nice indeed,” declared Celia. “Smells exactly like the sea… wonderful,” said Prue. Matthew agreed: “Chris has come storming back." Chris’s storm lost some some momentum during the main course, with a dish called “The Pig Club” which starred, predictably, a whole lot of pork. Oliver called it “a festival of meat” though not everyone thought this was a good thing (except when it came to the black pudding, which the judges unanimously agreed was outstanding). 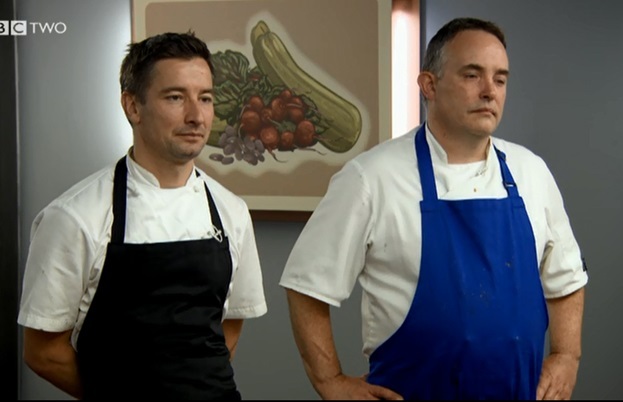 In the end, the judges seemed non-plussed by Chris’s main. Raymond’s “Officer’s Mess” received more accolades, particularly of the stew which Celia felt Winston Churchill would have liked: “this is exactly what the soldiers should have been served." With highs and lows for both chefs, it was left to the dessert course to make one final lasting impression. Chris's “Can All You Can” did just that. Coconut sponge and lime curd, passion fruit and citrus cream, rice pudding ice cream and crispy pineapple tuile came together to wow the judges. “Credit to the detail,” said Matthew, who particularly loved the “crunchy bit of pineapple caramel." “This rice pudding ice cream is a triumph,” said Celia. Raymond struggled to top Chris with his “Comfort with Style” dessert of brown bread pudding, chestnut brittle and brown butter ice cream. The presentation was spot on (“before I even eat it I can see it at the banquet,” said Oliver) but alas, the taste experience was a “force of diminishing returns”. So it was perhaps no surprise that Chris was declared the overall winner, with his standout dish being the finishing flourish of his coconut dessert. Raymond was visibly gutted, and Chris, elated beyond words. 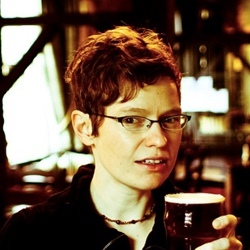 So congratulations, Chris McGowan! Well done on creating memorable dishes that honour those who fought for our freedom during the second world war. Winston would have been proud… and very well fed indeed.